Our specialty raspberry crop is grown in polytunnels at Stanthorpe, southern Queensland, providing this cool-climate fruit protection from the harsh Australian sun. Specialty raspberries are produced under polytunnels at Stanthorpe. 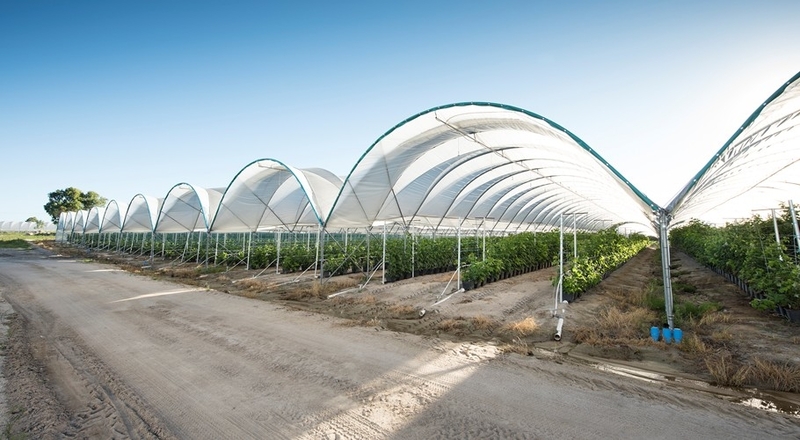 The farm, in Queensland's coolest region, provides the ideal natural conditions supported by protected cropping infrastructure comprising 15 polytunnels spanning approximately a hectare. A further 2.5 hectares was planted for varietal and production trials in 2018. A specialty variety, bred in the United Kingdom and now growing under Australian conditions, has been selected primarily for its flavour and appearance attributes. Several other varieties are growing under trial. Raspberry plants are perennials which grow from canes. The cane or stem lives for two years. New canes, known as primocanes, are produced each year from roots or buds. Canes are upright or semi-erect and may reach up to about two metres when supported on trellises. In this region, raspberries are ready for harvest about 100 days after planting. Because individual raspberries ripen at different times, pickers need to progressively revisit a bush to gather fruit as it ripens. Our raspberries are picked and packed with care into 125g punnets directly in the field and transported to market, after a short period of chilling. The raspberry season spans January to May with the peak falling in February, which is Australia's traditional raspberry season.